We all know we should eat more fish. We all know it’s good for us. What we don’t always know is a great way to make eating fish feel new and exciting. Because how many times can you get excited about baked fish? Personally, I set a goal to eat fish three times a week. And that’s good news for you, because that has forced me to come up with some inventive and delicious ways to eat this healthy, lean protein. Even full-flavored — and slightly fattier — fish like tuna is a great choice. One 4-ounce serving of fresh tuna has a whopping 28 grams of protein and about 1 gram of fat. Just 1 gram! But it sure doesn’t taste like that’s all it has. 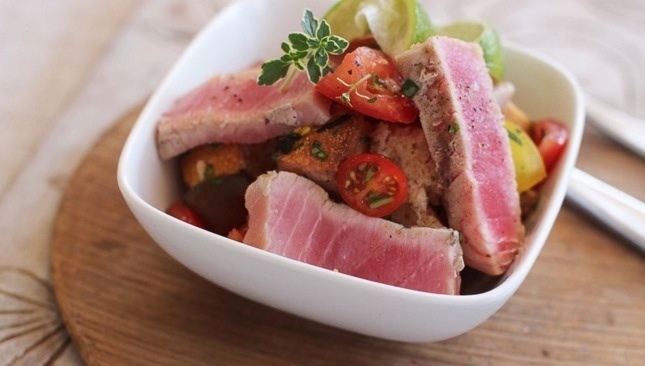 With its meaty texture and hearty taste, fresh tuna simply does not feel at all like diet food. I like to toss a gorgeous hunk of tuna on the grill. The flavor even can rival the satisfaction of a juicy steak (and I am a self-professed meat lover). And once it comes off the grill, I like to turn it into my version of an Italian panzanella (bread) salad. I toss the tuna with some grilled summer veggies and bread off the grill, then serve it on a colorful heirloom tomato salad. Heat the grill to medium-high. Chop the tomatoes into about a 3/4-inch dice, then add to a large bowl. On a rimmed baking sheet, arrange the squash, zucchini, scallions, bread and tuna. 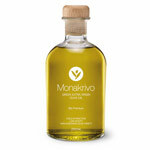 Brush everything with the olive oil, then season with salt and pepper. Grill the ingredients in batches, returning them to the baking sheet as they finish. Grill the squash and zucchini for 3 to 4 minutes per side, or until there are grill marks but the vegetables are not cooked through. Grill the scallions for 2 to 3 minutes per side, or until they are wilted and slightly charred. Grill the tuna for 2 to 2 1/2 minutes per side; the center should be raw. Grill the bread for 1 to 2 minutes per side, or until crispy and golden. Allow all grilled ingredients to cool for 5 minutes. Rub the garlic clove vigorously on one side of each slice of toasted bread. Chop the scallions into 1/4-inch slices, then chop the squash and zucchini into 3/4-inch pieces. Break or cut the bread into roughly 1-inch pieces. Slice the tuna 1/4-inch thick, cutting across the grain. Add the scallions, bread, squash and zucchini to the bowl with the tomatoes, then add the cilantro, basil and vinegar. Toss lightly, then season with salt and pepper. Divide the salad between 4 bowls, then top each with a quarter of the tuna. Serve with a lime wedge. Nutrition information per serving: 690 calories; 180 calories from fat (26 percent of total calories); 20 g fat (3.5 g saturated; 0 g trans fats); 45 mg cholesterol; 1,140 mg sodium; 86 g carbohydrate; 7 g fiber; 14 g sugar; 45 g protein.